The weather is supposed to be dreary and gray this entire week. Not good for taking outfit pictures, but I will see what I can do. At least I still have some shots from this past weekend to update the blog with. You shall see later. In the meantime, say hello to another Manic Monday. Crazy how they keep coming and going like jet planes or a cheetah running across an African savannah. nice tee you got nana! your place looks awesome!as for the t-shirt, you can't go wrong with a clean cut simple one! Fun tee! A great way to show Alexa love! Love the first pic. And Alexa tee is AWESOME. 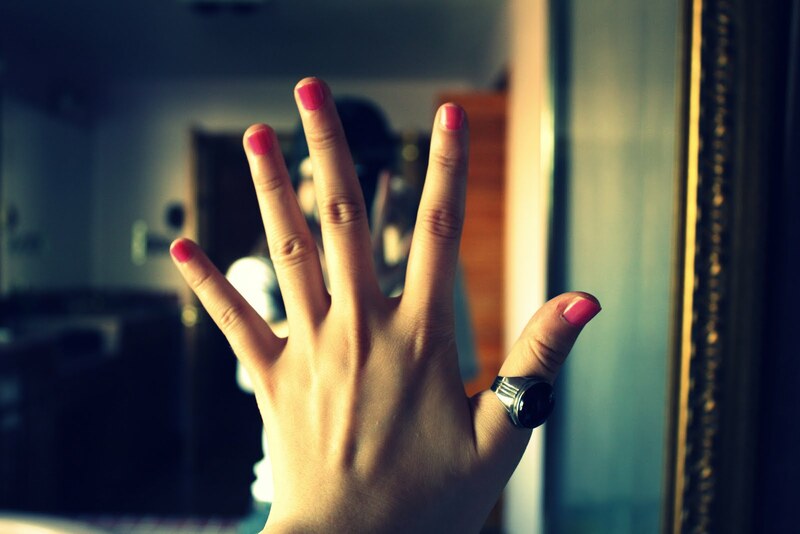 i love your shirt and you nail color. wow wow wow. love your shirt and these pictures are gorgeous!! And you take amazing photos! wow the shirt is sooo cute and i loveee your headband!!!! Love the tee and the head-band. lovely....love the alexa tee...great feel to the photos..!!!! lovely illustration, like your scarf too! The tee is just gorgeous and you are adorable!! Love that lipstick color on you!! Cute photos. I don't know if I will ever wear a shirt with a persons face on it. I mean the illustration is great, but I don't know I'm not the type who even wears band shirts...maybe I'll start hmm. I want to invite you to visit my blog and see the video that I did about the city where I work and study. I love to share with the international bloggers, images and videos of my country. Hope you like it. 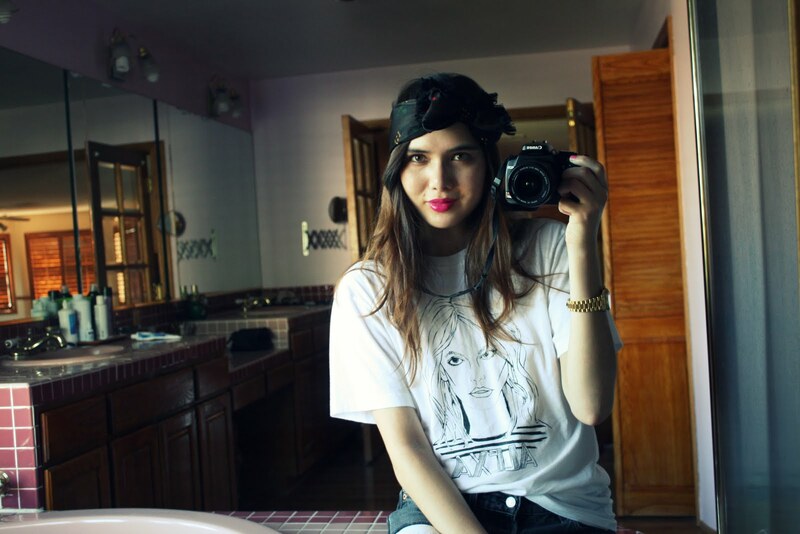 awesome tee :) Love your lip color! you always have such an adorable laid back look! great pictures! tee with alexa is so gorgeous! I always love your shots. you capture depth in the simplest of photos. btw, great job on the Free People shoot, you did amazing. 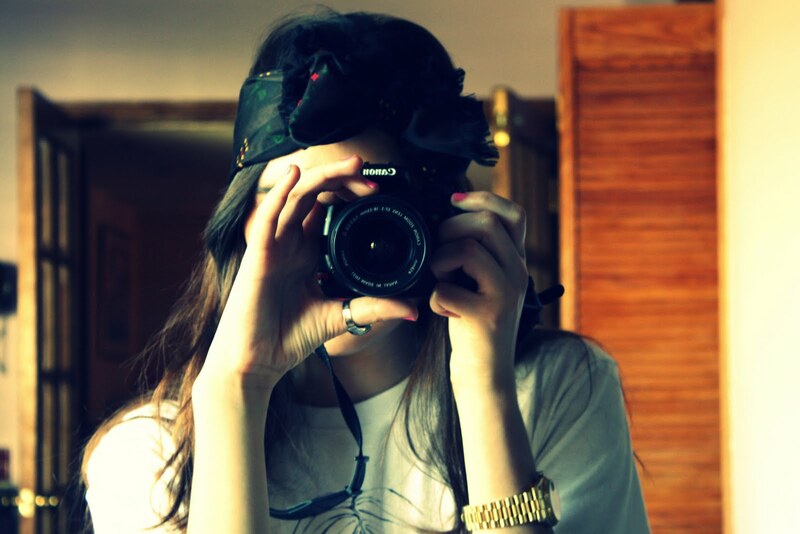 Good camera... but Im nikonista!! don't tempt me...i need to stop spending every dollar i earn!!! the photos are cool btw. I am loving your headband, the little bow is absolutely adorable. 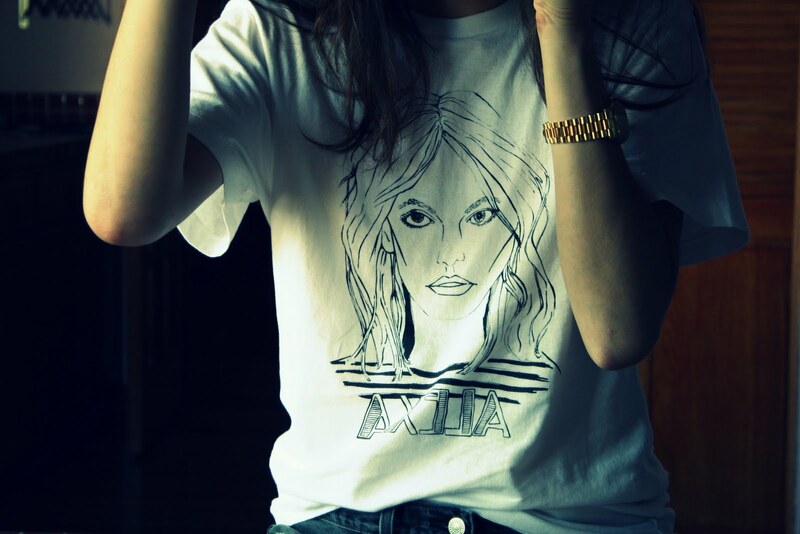 i love alexa chung:)cute tee! Wow your half chinese, i couldnt even tell! What a cool idea for a shirt! soo love the shirt!! ah i adore Alexa's style. would love to get that shirt too. thanks for sharing about the artist :). and ur nail color is lovely btw :). Nice shots! Especially love your headband! Great tee! I'm going to have to get the Daisy Lowe one. I wish I could take such beautiful indoor photos like these. Stunning. i love that first picture - the hair, the camera, the lipstick - what brand is it? I'm thinking about buying one of thouse great t-shirts, they're so original!!! amazing pics and nailpolish! You'rfe so cool with this look! goodness. i love the alexa tee so much. it's nice to have your icon on a superb tee too. oooo what a cool bathroom shot! i swear, from looking at yours and Natalie's photos, your house looks MASSIVE! judging from the size of the bathroom and natalie's bedroom before in her earlier posts! anywho! getting a tad off track! loving the tee! and YOUR HEADSCARF! I really like how your nail varnish and lipgloss match!! http://lekisskiss.blogspot.com <-- Make sure you enter my Tory Burch giveaway!! LOVE the tee!!!!! You look great! I've just started following your blog and am really enjoying it! We have dreary weather up here in SF, but that's ok as rain outfit pictures are fun too!! your amazing! an inspiration in fact! *Swing by to enter a $100 GC to Shopbop! love the bow! looks great. stumbled upon your blog and its lovely. love your tee, headwrap, ring, watch, and your GIGANTIC bathroom too! Superrrr cute bow! looks great on you!